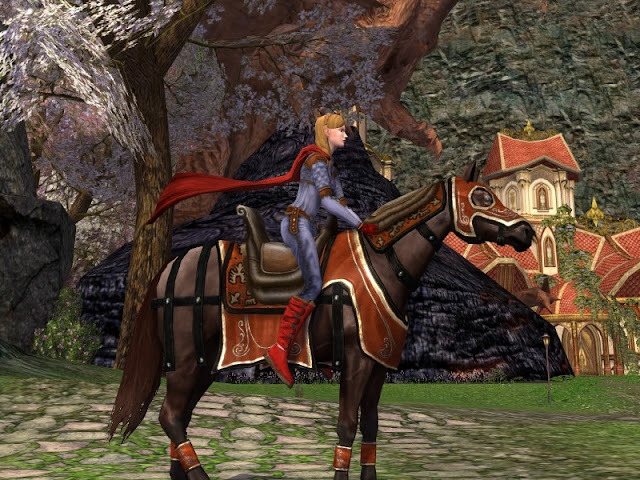 As always, every steed in lotro can be found at All the Steeds. 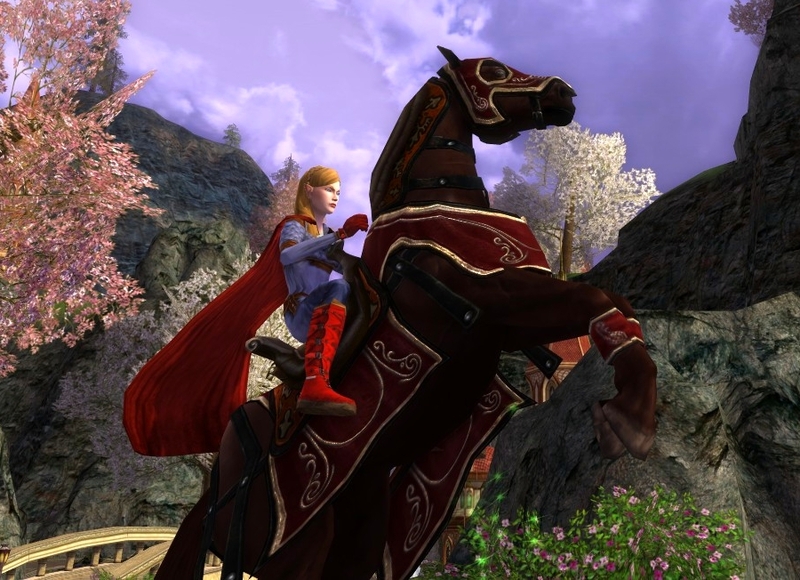 June steed is called Steed of Rhun. The first thing I will mention is that I recognized the pattern of the Rhun horse outfit because I had seen it before. The Rhun cosmetics were (and mebbe still are) a rare drop from the *corrected* Riddermark lootboxes. I don't know many details of it, but I do know that over the past year I have gotten 2 of the Rhun pieces (hence my recognizing the pattern). 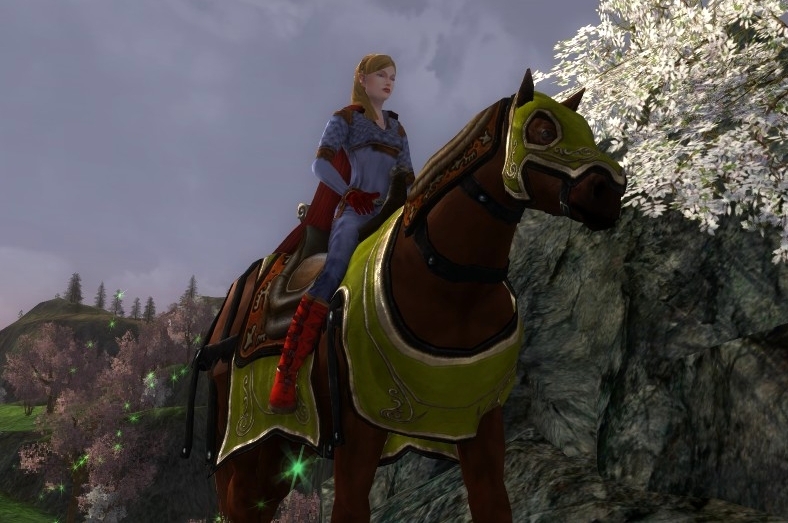 When I made my purchase of the horse, the other 2 cosmetic pieces showed up in my inventory. 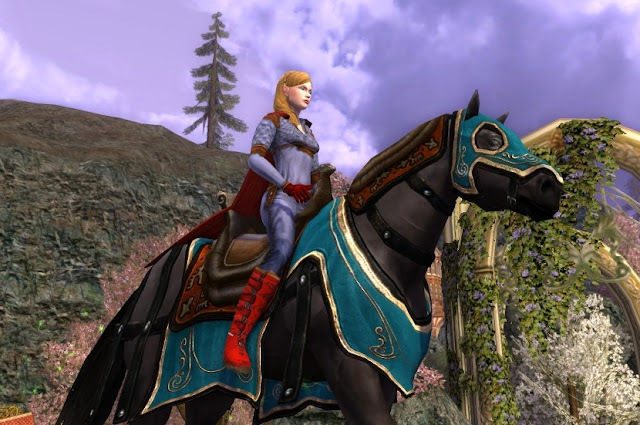 If you have never gotten any Rhun pieces, your purchase of the Steed of Rhun will come with the four pieces seen here: Halter, Caparison, Leggings, Saddle. 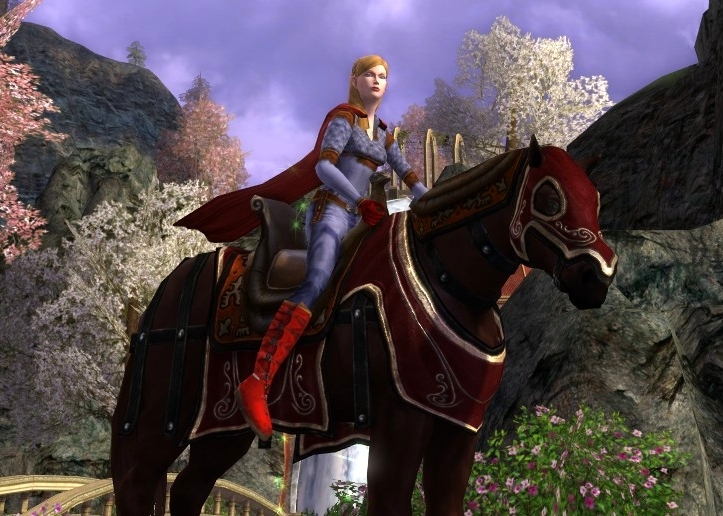 Steed of Rhun: Here is the basic horse. He is a brown horse with orange outfit. Warsteed of Rhun - default appearance. 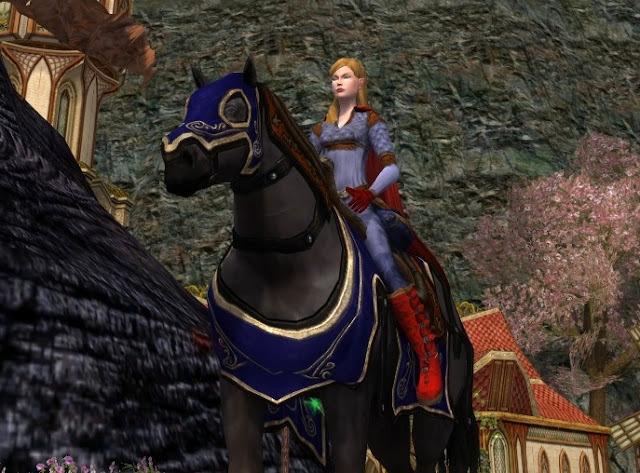 I was initially thrown by all the orangey look of the barding. 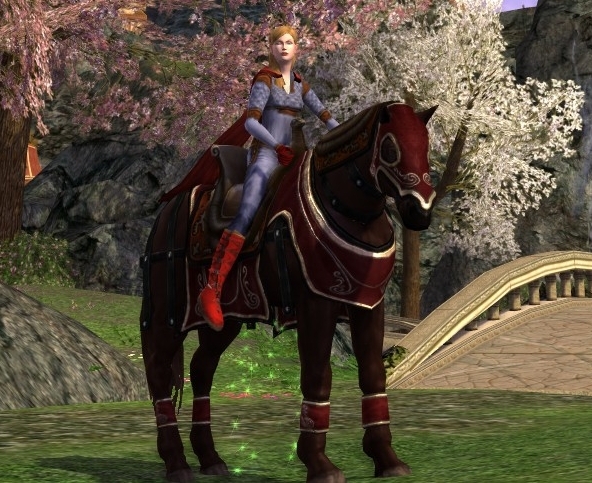 How would these steed cosmetics dye? The more different looks I see on it, the less I notice the orange. The red and brown hides tend to deemphasize the orange also. 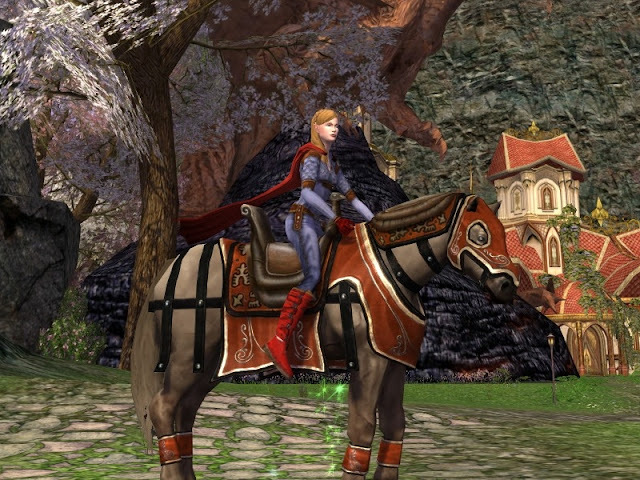 By the way, this orange is not in the color palette for barding... it is a dark orange I will call "Rhun orange". Here is the Crimson cosmetic with white hide. 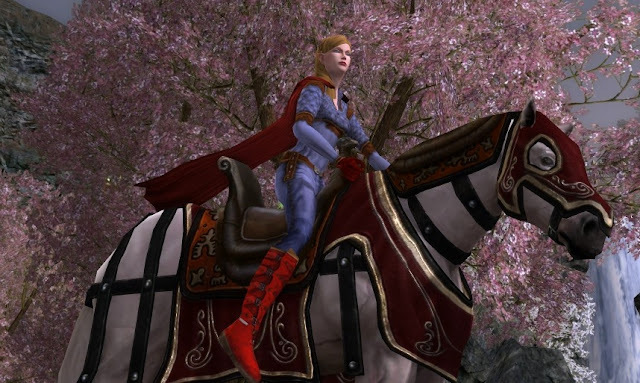 Warsteed of Rhun - Crimson and Black Chestnut: Leggings! Yes, the Warsteed comes with Leggings. I notice that most of my pictures chop off the leggings.Here is a shot of leggings to show that they do dye correctly. hmm I like him but I think I'll pass this month. I do hope they repeat some of the older ones soon. These steeds and their tack can get expensive for an adventuring rune-keeper. So I shall look longingly and pass on this one. Right now I am focused on getting my warsteed at last. One question I have is where would you like us to post tips and ideas if they don't belong under your blog? I have been using a skill bar layout with mouse keys that really changed the game for me and opened up more flexibility in my rotations. I thought others might find it helpful too. I trust your judgement on that one Ketani. I had forgotten from where I had gotten it. Digger, there will be others for you in time. Festival is a great place to look for good warsteed cosmetics. Good luck! Often, people put comments they want to add about Runekeepers under one of the many runekeeper posts, and I still get comments months after the articles come out. HOWEVER, you make a good point about a lack of centralized RKing on the site... so I unlocked comments on the page http://www.danania.net/p/danania-85.html (link will also always be at the top of this post). Thanks, Danania. Maybe lots of folks will share their ideas here. Anyway, I will post my little thought in hope it helps others. I won't be buying this steed, but thank you for the pics Danania! Hmm Alysia... As far as I know, every store steed has come back around for purchase eventually. As you see though, with as many steeds as they have made, they may only show up once a year at most. TheElvenTailor... you are very welcome. Glad it helped you make a decision about it! The more I ride it, the more I enjoy it. :) ... but I think I say that about every steed. Where'd you get lipstick? I want some! lol Anonymous... That is just my natural face. Mebbe I was eating red popsicles before the photo-shoot.